Hal McCoy is a former beat writer for the Dayton Daily News (Dayton, Ohio), covering the Cincinnati Reds baseball team. He was honored by the National Baseball Hall of Fame in 2002 as the winner of the J. G. Taylor Spink Award, which is awarded annually "for meritorious contributions to baseball writing." He has won 43 Ohio and national writing awards and was the first non-Cincinnati newsperson elected to the Cincinnati Journalists Hall of Fame. McCoy has been the Cincinnati BBWAA Chapter Chair 22 times and was the BBWAA national president in 1997. He is the third writer from the Dayton Daily News to win the J. G. Taylor Spink Award, joining Si Burick (1982) and Ritter Collett (1991). Residing in Clayton, Ohio, McCoy is an honors graduate in journalism from Kent State University. Redskins roll into Division IV state final on Shane Hilgefort’s sacrifice fly and Jared Middendorf’s pitching. 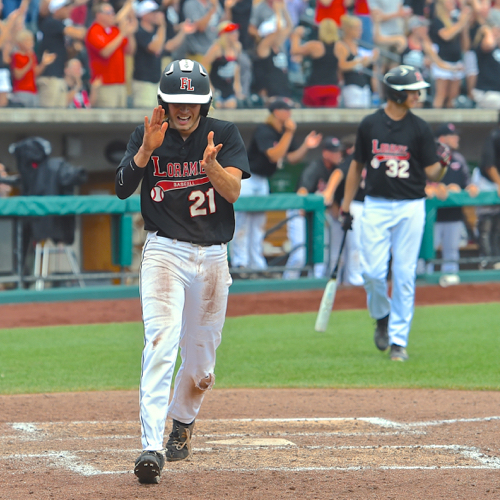 It was the biggest clutch moment in Hilgefort’s baseball career and he passed it with flying colors Thursday morning, the black and red colors of the Fort Loramie Redskins. 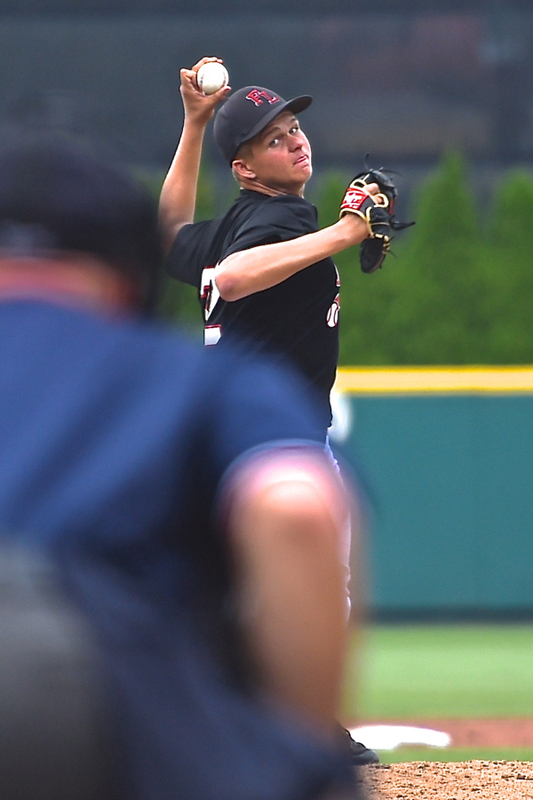 It was the Divison IV state high school baseball semifinals and Fort Loramie and Garfield Heights Trinity were tied, 1-1, in the top of the seventh. Fort Loramie had runners on third and second with one out after Mike Hoying was hit by a pitch, Devin Wehrman walked and both moved up on a wild pitch. That brought up Hilgefort, a junior second baseman batting ninth and as first-year coach Jeff Sanders said, “We put him at the bottom of the order because he is our best bunter. He can drive in runs, he has great plate appearances, a great approach. “Any time he needs to get something done, whether it is hitting the ball to the right side, sacrifice fly, base hit, he is the perfect nine-hole hitter,” said Sanders. 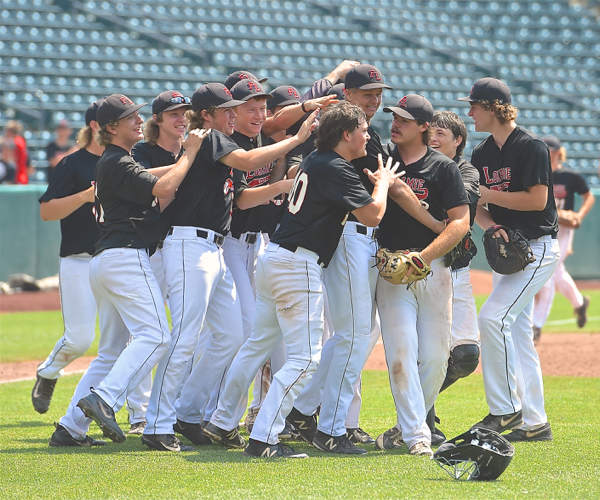 This time it was the sacrifice fly route, a drive to right field that scored Mike Hoying from third base, the run that won the game, 2-1, to send Fort Loramie (26-6) to the final Saturday morning in search for a third state championship. “We had our best bat-handler at the plate and I gave him a little signal to put his head down and hit the ball the other way and sure enough he hit a sacrifice fly the other way,” said Sanders. Carter Mescher put up the first score for the Redskins from CJ Billing’s triple. As they have done throughout the tournament, the Redskins had to claw back from early deficits, although this one was just 1-0 entering the sixth inning. They were facing a hard-throwng left hander named Jake Visha and he held the Redskins to no runs and two hits through five innings. And Fort Loramie lefty Jarred Middendorf suffered some early indignities with walks. He walked the first batter he faced. He walked the bases loaded in the second but struck out designated hitter Ryan Foss to leave all three perched harmlessly on the bags. 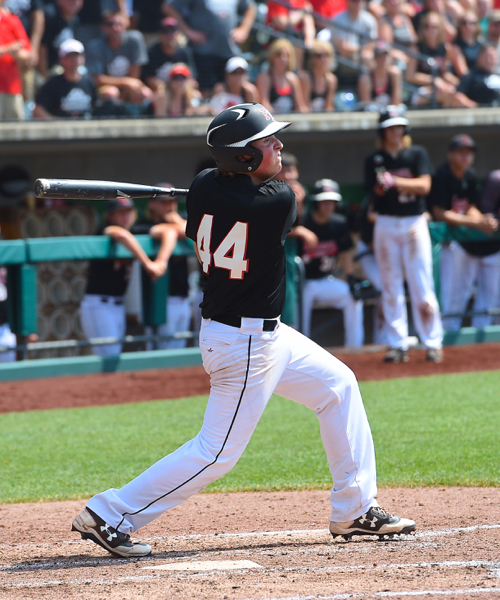 Phoenix Bats, an Ohio company, is proud to support the OHSAA state baseball tournaments on Press Pros Magazine.com. But the Fort Loramie coach was happy to see his pitcher, Middendorf, still standing at the end. 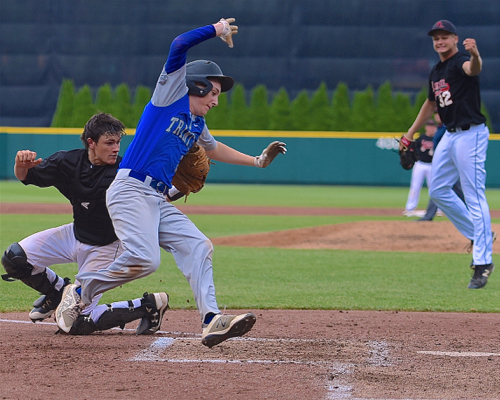 Loramie’s catcher, Darrin Hoying tags out what would have been the tying run. Middendort pitched a complete game, 94 pitches worth of one-run, three-hit, five-walk, six-strikeout work. And he put an exclamation point on the day by ending it with a strikeout of designated hitter Ryan Foss, a 1-2-3 inning. “When he struggled a bit early, he tweaked it himself and told himself, ‘I’m not going to let this happen, I’m going to get it done,’ and he did,” said Sanders. Trinity broke the scoreless ice in the fifth by scoring a run, but the inning could have been catastrophic. Zach Mammano opened the inning with a double to left field. No. 9 hitter Michael Clancy pushed a perfect bunt up the third base line. Third baseman C.J. Billing picked it up and threw wide of first base for an error that permitted Mammano to score from second for a 1-0 Trinity lead. CJ Billing’s triple drove in the first run for the Redskins. Clayton tried to score from second on a base hit and shortstop Eli Rosengarten threw him out at home, a mammoth defensive player as the game turned out. And Trinity still had two on after another Middendorf walk. When in trouble, give ‘em the heater, Ricky. Middendorf’s first name is Jared but he gave Trinity clean-up hitter Kevin McSweeney the heater, an 84 miles an hour fastball, and struck him out to leave the damage at 1-0. Billing would more than make up for his throwing inaccuracy on the bunt. Carter Mescher opened the sixth inning with a bunt single and Billing unburdened himself with a triple over the center fielder’s head that one-hopped the wall where it reads 400 feet. That scored Mescher to tie it, 1-1. And it was not unexpected. Shane Hilgefort hit a SAC fly that drove in the winning run of the game. Winning 2-1 isn’t Fort Loramie’s style, unless it is necessary. The time was right on Thursday and because of it Fort Loramie finds itself seeking its first state title since 2011. Ft. Loramie’s teammates celebrate around pitcher Jared Middendorf, who pitched a complete-game 2-1 win over Trinity. 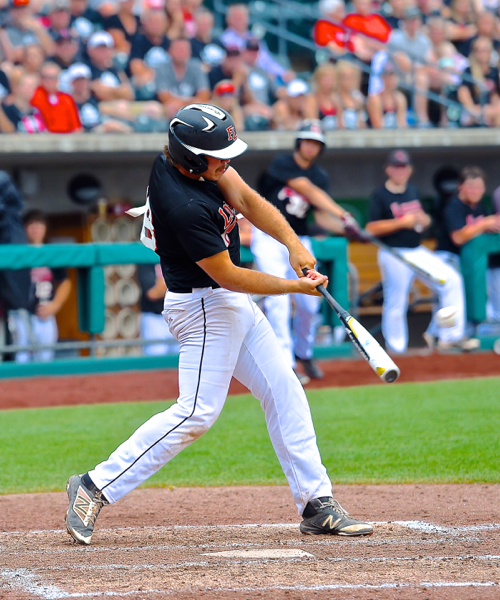 “The Spot” Restaurant, in Sidney, is proud to be the official sponsor of the 2018 OHSAA State Baseball Tournaments on PressProsMagazine.com.